Mary McInnes Obituary - Haileybury, Ontario | Buffam Leveille Funeral Home Ltd.
"Just heard of the recent passing of Mary. Sending heartfelt condolences to the "
McInnes, Mary [Sarachman] - It is with deep sorrow that we wish to announce the passing of Mary McInnes at Extendicare Nursing Home in Haileybury on July 30, 2018. She was born December 20, 1925 in Waniowyczi, Poland, and immigrated with her mother to Canada in the 1930’s. Mary is predeceased by her parents Paul and Ann Sarachman, husband Archie, and son-in-law Roger Nabb. She is survived by her daughters Patricia McInnes and Sandra (Frank) DiLosa, sister Jean (Frank) Henry, brother Walter (Patricia) Sarachman, sister-in-law Barbara (Ken) Blair, by her grandchildren Paul and Catherine DiLosa, and by many nieces and nephews. Mary lived most of her life in Kirkland Lake and was a member of St. Andrew’s Presbyterian Church. In 2010, she and her husband moved to Haileybury and resided at Place Sainte Marie, where they enjoyed the company of many good friends. In February 2018, she entered Extendicare Nursing Home where she lived until her death. 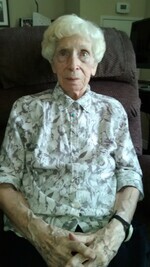 Mary enjoyed many activities, including golfing, curling, bowling, bridge, and reading. She was also an expert seamstress and loved doing metalwork. Mary was a very caring and nurturing person who had many friends during her life. She enjoyed her short time at Extendicare, where she participated in all social activities and was always surrounded by friends and very caring, compassionate staff. The family would like to thank Dr. Amanda Corbiel, Dr. Don Davies, the staff at Extendicare Haileybury, and her personal support workers from Timiskaming Home Support. As an expression of sympathy, donations to the CNIB and Temiskaming Home Support would be greatly appreciated by the family. Visitation will be held at Buffam Leveille Funeral Home, Thursday, August 2, 2018 beginning at 10:00 am followed by the funeral service at 11:00 am. Rt Reverend Mike Fedechko officiating. Interment to follow at the Kirkland Lake Cemetery. Condolences may be left at www.buffamleveille.com.